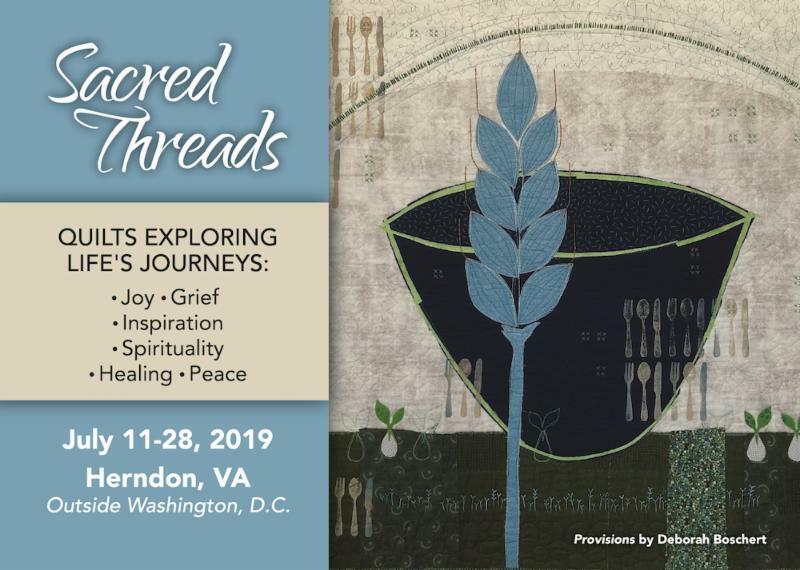 In this newsletter we are discussing shipping to and from Sacred Threads. If more than one quilt was accepted they may be delivered in one box. Your quilt must have a 4" hanging sleeve sewn to the top edge of the back of your entry. Cover any fragile embellishments to protect them during shipping. Enclose an envelope inside the box. On the outside of the envelope, write your name and the title of your quilt(s). A pre-paid label for return shipping. This label must be ready to be scanned and picked up by the shipping company driver. (Do not use a voucher or provide a filled-out form with your account #. This is not a label.) If you will not be home when we ship out on July 30, please plan to ship to someone who can receive your quilts(s) for you. A written appraisal, only if you valued your quilt over $1000. Choose a sturdy reusable box. We will use your box and shipping materials to return your quilt to you. Place your quilt inside a plastic bag. Place the quilt in the shipping box. Place the envelope with your name and pre-paid label in the box. Use bubble wrap or quilt batting if additional packing material is needed. Do not use Styrofoam packing peanuts. Seal the box well and put your shipping label and return address on the top of the box. Do not write "Quilt" anywhere on your package. We recommend choosing a shipping company that will track your package. UPS or Fed-Ex are good choices. DO NOT SEND YOUR QUILT EARLY to the church venue. The locked storage room is not available to us until July 1, 2019. Quilts may be dropped off in person on July 5, 2019 from 12pm to 4pm. Quilts may be picked up again on July 30, 2019 from 12pm to 4pm. We will have committee members on hand to help you with your drop off or pickup. Please bring your quilt with some protective covering (e.g., pillow case, plastic bag, box) with your name clearly marked on the outside covering. You have been notified and agreed to ship your quilt early to Barbara Hollinger for photography for the catalog. Your prepaid label will most likely not still be good for the end of July. So we will work this out with you later. You are shipping from Canada and are concerned about making the shipping window. 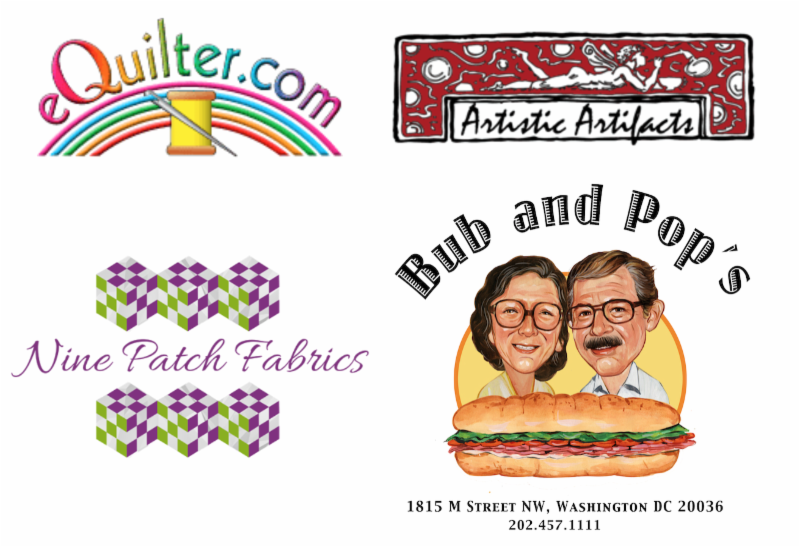 Please contact Barbara Hollinger at hollinger.quilts@gmail.com. She will work with you to receive your quilt early at her home. Your quilt is one of 36 that has been invited to travel. You do not need to provide a pre-paid return shipping label. We will work return shipping with you following the traveling exhibit in 2021. Also, we will not be storing the packing materials or boxes, so don't use any packing materials that you need returned. If you are unsure about whether your quilt was invited to travel, you can check this list: Artworks 2019. Keep spreading the news about Sacred Threads. Sacred Threads is calling all fiber artists to make a 23" (w) x 5" (h) piece featuring human eyes. The deadline is May 31, 2019. All works will be accepted for this very special installation. Sacred Threads is grateful to the financial support of our sponsors. Please visit their websites and generously support their businesses.